Starting development for Microsoft Dynamics CRM 2011, the first challenge we face is how to connect to the CRM. Communication with Microsoft Dynamics CRM 2011 through the code mostly comes to interaction with two Web Services supplied by the CRM: so-called Discovery (IDiscoveryService) and Organization (IOrganizationService) Web Services. For a certain Microsoft Dynamics CRM installation the URL to the IDiscoveryService is unique. To be more precise, it’s unique for an on-premise installation while for Microsoft Dynamics CRM Online it might be one of a few variants depending on the world region. Read more about possible URLs to the Discovery Web Service here. In the same time, a single Microsoft Dynamics CRM installation can host multiple business organizations on multiple servers. Accessing data for a particular organization through the IOrganizationService, we have to use the URL specified for that organization. Often after the initial connection the received URL to IOrganizationService is stored somewhere to be used next times as it allows omitting the interaction with Discovery Web Service. However, we have to bear in mind that, in boundaries of a particular installation of Microsoft Dynamics CRM or Microsoft Dynamics CRM Online, the location of servers and organizations may change due to some datacenter management or load balancing. Therefore, we should use IDiscoveryService from time to time since it provides the actual URL to the IOrganizationService that serves our organization at a given moment. For example, we could try refreshing our connection string for IOrganizationService when we fail to access organization using the URL received previously. // Enable early-bound type support. The ServerConnection uses the DeviceIdManager class inside. The class defined in the SDK\SampleCode\CS\helpercode\DeviceIdManager.cs is intended to register a computing device with Microsoft account (Windows Live ID) and needed only for authentication in Microsoft Dynamics CRM Online. So, to use the ServerConnection we have to add both CrmServiceHelpers.cs and DeviceIdManager.cs files to a project. The ServerConnection.Configuration class is to encapsulate all information needed for setting up a connection to Discovery Web Service. Based on the object of ServerConnection.Configuration, ServerConnection creates a proxy for IOrganizationService. Note, however, since ServerConnection is designed to work within sample console-based applications, it has some “features” that are not applicable for other types of projects. For example, the following could be placed among such “features”: prompting user to type credentials in the console window; persisting CRM server connection information to a file C:\Users\<username>\AppData\Roaming\CrmServer\Credentials.xml for later reuse; storing user password in the Windows Credential Manager. Fortunately, all of the mentioned points might be overcome by creating a class inherited from the ServerConnection and by implementing our own mechanism of reading parameters required for establishing a connection to CRM. The custom class shown below exposes the methods that parse the xml string containing connection parameters and return a proper instance of ServerConnection.Configuration. That allows keeping parameters wherever we want, we are not bound to the file system or Windows Credential Manager anymore. That’s quite important if we plan to use the code in Windows Azure, for example. // Obtain organization information from the Discovery service. // Obtain information about the organizations that the system user belongs to. In case the OrganizationUri isn’t set in the xml string the Parse method tries getting the URL from Discovery Web Service using the name specified in the OrganizationName node. The OrganizationName can contain friendly or unique name of the target organization. Note we need to slightly modify the original ServerConnection class, we need to make protected such its members as RetrieveAuthenticationType (method), GetDiscoveryProxy (method) and config (field) so that they would be accessible from within the derived ServerConnectionEx class. // Obtain the target organization's Web address and client credentials from the xml string. In the example we have a hardcoded xml string with connection parameters, in the reality, however, the string could be stored in whatever data store. Note also that to use CrmServiceHelpers.cs and DeviceIdManager.cs you have to add such references to your project as System.Runtime.Serialization, System.Security, System.ServiceModel, System.DirectoryServices.AccountManagement and Microsoft.IdentityModel. The Microsoft.IdentityModel is a part of Windows Identity Foundation, so install it if it’s not already installed. The dll itself can be found at Program Files\Reference Assemblies\Microsoft\Windows Identity Foundation\v3.5 or in GAC. And, of course, you need to add references for Microsoft.Crm.Sdk.Proxy and Microsoft.Xrm.Sdk. You can find them in SDK\BIN. A simple demonstration project you can download here – ConnectToCrm.zip. Among others files it contains the adapted CrmServiceHelpers.cs and DeviceIdManager.cs. 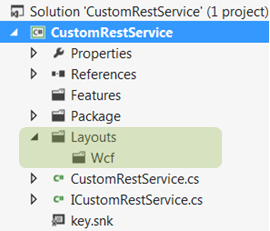 In the given blogpost I’ll describe step by step how to create a simple REST WCF Service residing in the _layouts folder. To create a demonstration project we’ll use Visual Studio 2012. I believe, however, the similar steps could be done in Visual Studio 2010 as well. * Don’t look for a meaning in the source code of the demonstration project as its main goal is just to show how to communicate with WCF Services operating under SharePoint and how they return and accept parameters of standard and custom types. * Note that if you plan to add the service to an existent project, just skip this step. 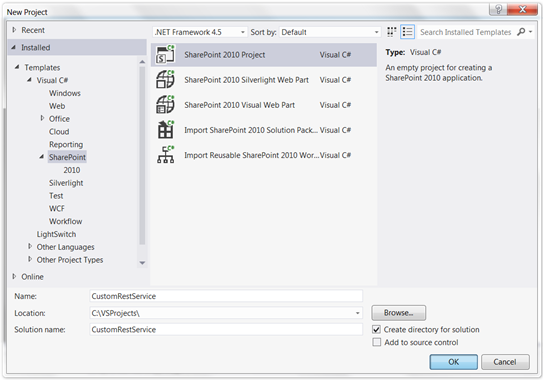 Go to FILE -> New -> Project and select the SharePoint 2010 Project available under Templates/Visial C#/SharePoint (see the image below). Type the name and location of the project. Let’s name it CustomRestService. 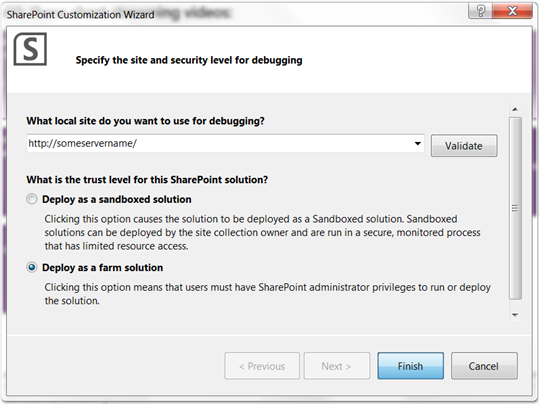 Click OK button, then the SharePoint Customization Wizard opens (see the image below). Type the proper URL of the local site for debugging and choose the Deploy as a farm solution option. 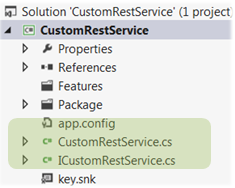 Ensure that the CustomRestService project is selected in Solution Explorer and then go to PROJECT -> Add New Item. 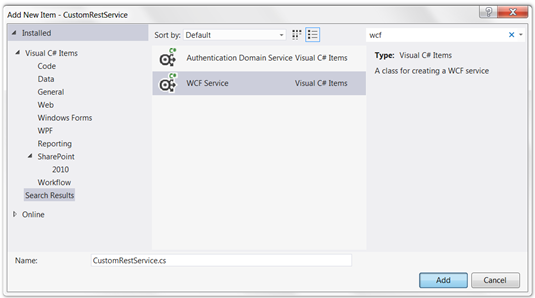 In the opened dialog, locate the WCF Service among available templates. It’s usually under the Visual C# Items. Alternatively you can find the required template by typing WCF in the search box (Search Installed Templates) at the right top corner (see the picture below). Let’s name the service CustomRestService as well. Delete the app.config from the project as we don’t actually need it. 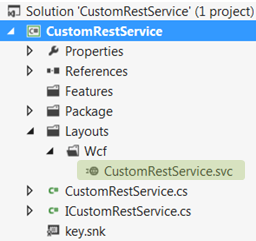 * If you don’t have the WCF Service template available in Visual Studio or you don’t want to use it for some reason, you can just add two .cs files, ICustomRestService.cs and CustomRestService.cs, to the project. In this case don’t forget to add references to such assemblies as System.Runtime.Serialization and System.ServiceModel. 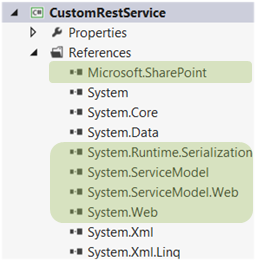 Ensure the CustomRestService project is selected in Solution Explorer and then go to PROJECT -> Add Reference…. In the opened dialog, find the System.ServiceModel.Web and System.Web assemblies (usually they are located under Assemblies/Framework) and check the checkboxs against them (see the picture below). The highlighted assemblies are essential for developing WCF Services operating under SharePoint. 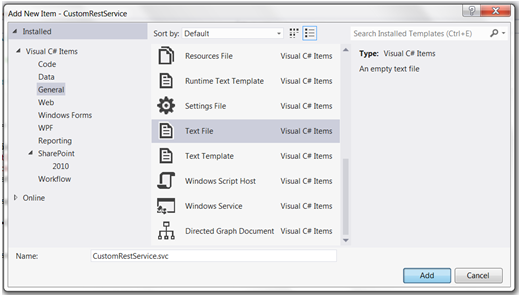 Here the ServiceResult is a simple class that wraps the service result and provides the error message in case it occurs. The Book class provides basic info about a book and is intended to show how REST WCF Service deals with custom types. ErrorMessage = "Book title is undefined!" ErrorMessage = "Invalid book id!" The implementation operates with the Books list and assumes that the list is available at the SharePoint Site in the boundaries of which the service is called. Note that we work with SharePoint objects in the same way as we would do this in code-behind of an .aspx-page. The GetBook and AddBook methods require users to be authenticated before calling them, while the BookExists allows anonymous access (of course, in case it’s turned on for Web Application and Site). Since it’s a best practice, always put the checking whether user is authenticated and authorized in the beginning of every web method unless you have some contrary requirements (for example, to provide anonymous access). * Note that if you already have the folder, just skip this step. Ensure that the Wcf folder nested in the Layouts is selected in Solution Explorer and then go to PROJECT -> Add New Item. In the opened dialog, locate the Text File among available templates. It’s usually under the Visual C# Items/General (see the image below). Name the file CustomRestService.svc. The MultipleBaseAddressWebServiceHostFactory declares the REST type of the Web Service and creates proper endpoints with Web Bindings. The factory takes upon itself the configuring of the Web Service, that is why we don’t need the app.config deleted previously. * Note that, having modified the .csproj, you likely will be prompted by Visual Studio to reload the project. * Note that for the project attached to the given article, the .csproj has been already modified. Of course, instead of the $SharePoint.Project.AssemblyFullName$ you can use the real full name of your assembly. To get such name I usually use .Net Reflector. Alternatively you can make Visual Studio display the name, following instructions from the article How to: Create a Tool to Get the Full Name of an Assembly. Right-click the CustomRestService project in Solution Explorer and then click Deploy. Behind the scenes, Visual Studio compiles the project, creates a .wsp file and deploys the package to the farm. If you see the message “Endpoint not found“, don’t worry, that’s what we need. That means all of the steps above have been done correctly. Let’s test the web methods of the service. As you remember, the service interacts with the Books list. It’s a list with two main fields: Title and BookAuthor, both are Single Line of Text (see the image below). * I do not cite the list’s schema here as you can find it (schema, instance, feature to create the instance) in the attached project. <asp:Button ID="test" Text="Test Web Methods" runat="server"
Pay attention to the URLs used to send request to web methods. The given test page is located directly in _layouts, so to access the Web Service placed in the _layouts/Wcf I use the relative URL Wcf/CustomRestService.svc. If your page dealing with the Web Service resides somewhere outside of _layouts or within the folders nested in _layouts you have to provide the proper URL (relative or not) to the Web Service. Click Test Web Methods button. If everything works fine you’ll get 3 alert messages and each of them starts with the word “Success”. The order of the alerts may vary as requests are asynchronous. The demonstration project you can download here – CustomRestService.zip. Note that the archive contains the .wsp package in the CustomRestService\bin subfolder, use it in case you are not able to compile/build the project for some reason.